Toolmaker vises are a smaller and more affordable workholding option. when the work needs to be moved from one machine to another, such as taking it from a mill to a drill press, surface grinder or to a larger machinist vise, tool maker vises are the best vises to choose. 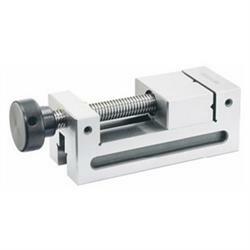 Jaw opening of the tool maker vise is 125mm. Length of the vise 250 mm. Height of the tool maker vice is 73 mm. Material of tool maker vise is SK2.